Review Summary: KRISHNA AUR KANS could've been a fascinating interpretation of a much-loved mythological. KRISHNA AUR KANS could've been a fascinating interpretation of a much-loved mythological. 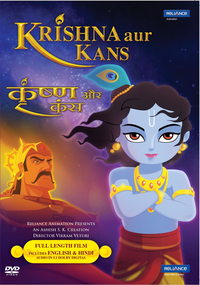 Krishna Aur Kans is just another average animation film dealing with mythological story. May just work with toddlers who are watching animation film for the first time. Life is a curse for the inhabitants of this kingdom that is ruled and threatened by the evil Kans. Can someone put an end to all this mess? Yes the eighth son of Devaki... provided he escapes the wrath and injustice of his maternal uncle Kans. It is nothing less than ironic when a film is titled 'Krishna aur Kans' but instead of the protagonist, it is the antagonist that turns out to be the best part of the affair. This is what happens in this Vikram Veturi directed animation film which stays on to be interesting when Kans is on the scene but loses momentum after Krishna makes his entry. This is the reason why the first and second half of the film are poles apart.While the first half is entirely about Kans, the second half has Krishna dominating the proceedings but not quite bringing the desired effect. Due to this reason after a decent build up, the film just slides down.